​​​​​​GEORGETOWN – Two projects expecting to break ground in 2018 would bring major changes to one of Georgetown’s central business corridors near the intersection of Hwy. 29 and I-35. 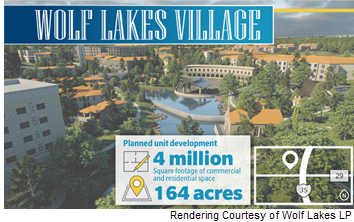 The bigger of the two future developments, plans for Wolf Lakes Village ​include up to 4 million sf of commercial and residential space on 164 acres. The project will be built across Hwy. 29 from the Wolf Ranch Town Center with an Italian-village style including stone buildings and streets, a central plaza, lakes and arched bridges. Walkability will be a significant component, as will the 10 percent of the development site that will be dedicated to parkland. Iva Wolf McLachlan, who serves as president for Wolf Lakes LP, expects the first phase of the development will break ground at some point in 2018. Once construction starts on the first phase, it would take about one year until completion and opening of the first structure. Full build-out on the development will likely take about ten years. With 250,000 sf of available commercial space, plans for this development call for a hotel, grocery store and medical office. Confirmed tenants include Jason’s Deli, Jersey Mike’s, Pet Supermarket, P. Terry’s and Tiff’s Treats. 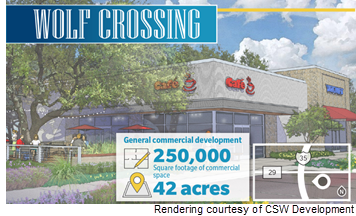 Todd Wallace, CSW Development’s CEO, anticipates construction on Wolf Crossing will begin by May 2018 with the first businesses opening by mid-2019.